I think there are very few who would disagree that tomato soup is one of the all-time cozy comfort foods. While I think lots of things can be soothing and comforting, tomato soup takes people back to their childhood – memories of their mom or dad making tomato soup and grilled cheese sandwiches. I still love that combo. Shamefully, though, I rarely make tomato soup from scratch. More often than not, when I’m in need of that severe level of comfort, it’s usually all I can muster to open a can and turn on the stove. This time, I used an excuse of a different sort to make a grown up version of tomato soup. A new blog event called Taste and Create pairs food bloggers up to create a recipe from their partner’s blog. I was happily paired with Nicole, the creator of the event. While perusing her blog, I came across this recipe for tomato soup. Fairly straightforward, it seemed…until I scrolled to the bottom of the ingredient list. There it was: GIN. You can’t be serious, right? There is a very short list of ingredients I can’t imagine cooking with…and gin is one of them. I don’t have an aversion to it – I’ve just never thought about putting it in food. That sealed the deal for me – this was the recipe for me. *** Editor’s Note: Those who know me will be quite taken aback by the site of croutons in my soup. I have a massive phobia of soggy bread. The thought of bread or crackers in soup takes me to my dark place. It haunts me at night. I’ll have you know that the ciabatta was toasted well enough that it didn’t get soggy too fast…and those that did go South while I was taking photos…were immediately removed and disposed of. Fear not. – In a large pot sauté the onions and garlic in the vegetable oil until the onions are soft. Add the tomatoes and all the dried spices and cook in the pot for 15 minutes with the lid on. Then pour in the beef stock and let cook for another 5 minutes. Then take off the heat and put entire soup into a food processor or blender and purée. Then return to pot and to medium heat and add the tomato paste and the gin. Stir until completely mixed in. – Once the soup is in individual serving bowls add 1 Tablespoon of Crème Fraiche to each bowl and stir in. This will make the soup much thicker. *Gin is an absolutely necessary ingredient for this recipe. You can leave it out, but it will just not taste right. I heard you can also use Sherry, but I have never tried it. Please go over to Nicole’s blog at For The Love of Food. She is hosting Taste & Create regularly. Take a peek at this round’s posts and get involved in the next one! Thanks to her for hosting such a cool event. This soup looks fantastic! Thanks for posting it. I love the idea of gin in soup. Someone should write a book similar to Jessica Seinfeld’s but instead of hiding vegetables in food, they sneak in alcohol. I love this! The soup looks delicious! I may have to try it just to know what gin in soup tastes like. I often use gin in salad dressings as well, with the same result. Great soup, btw. I’m so glad you chose the soup. It is, oddly enough, a favorit summertime recipe of time. I don’t make it in the winter when tomatoes are out of season. I’ll have to try it with vegetable broth next time. Your picture is absolutley breath-taking. 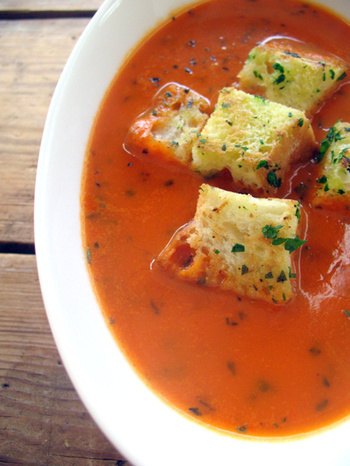 That tomato soup looks nice and tasty. I never would have thought to add gin but now I will have to try it. Gin? That’s rather original – I’ll have to try it soon! Hi, it has been a while. I too just wrote about comfor food (Swedish bread) and was drawn in by your tomato soup. Like you I was suprised by the idea of using gin, but there is a 1st time for everything, and you had such encouraging results! Also have a very strong aversion to soggy bread and that texture of food in general, so your crutons have given me hope. Pls stop by to say hello. hey there…. that soups sounds… incredible. To answer the pineapple question in your twitter… I have a really simple summer recipe. I take equal parts brown sugar and cinnamon, and mix them into a cup half filled with tequila. Then, I take pineapple that I’ve cut into slices and char it on the grill with a (tiny bit) of neutral oil. After the pineapple has gotten some nice black strips and color to it, I baste on the tequila/cinnamon mixture. This then proceeds to catch on fire and fill the vicinity with one of the greatest aromas I’ve ever smelled. I plate it with a dollup of good vanilla ice-cream. One of my favorite bbq recipes. Enjoy. I found you through Cookthink . . . congratulations in your runner-up status in the parsley challenge! I love your blog. I think you’re my new blogger crush! It sounds delicious…soggy croutons and all.